Most time travel research explore the disruption and causes resulting in time paradoxes. If time travel becomes a reality it would be necessary we would have to get rid of physical calendars… Time would not be static, instead is connected to a specific present reality. Aside from the physics challenges, it may generate infinite possibilities for new areas of research but also a complete different lifestyle. But there are many challenges still to overcome… for example, the grandfather paradox. So humans could continue to be technically alive forever… but they may not be able to withstand time travel at all. How would we keep our health if we can travel back and forward in time? Would it be possible to live beyond our current life expectancy? 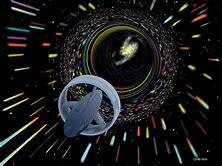 In science fiction, time travel results usually in the introduction of new universe containing the alternate timeline. In Interstellar, our upcoming society is fighting to survive, since most men and women shun technology in favor of blind hope, and just a number of fight to modify their fate. Google is now spending billions of dollars attempting to do it! But there are many other projects that go back much further in time. A good example is Project Pegasus. There are lot of people who profess to be aware of the future. They argue they can see the future… it’s all part of your destiny. Time travel will change destiny for sure… if there is one.